Stop right there! 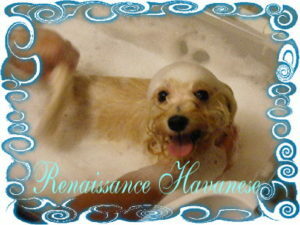 Unless your Havanese has no hair, you will need to thoroughly comb him and remove any tangles or mats from his coat. If you do not, mats can get even tighter and you risk having to have your Hav completely shaved down. Even if you pup has short hair, run a comb through it from the skin, if it gets caught up, you need to comb out the tangle. First, a working space, I can use a grooming table, a card table or a counter-top. A rubber bath mat or small area rug with rubber bottom will provide traction for the dog. Squeeze bottles with the little pull-up top. Usually available from a beauty supply store. You will need at least two. Eyewash solution (after bath to remove irritation, from shampoo & water. Shampoo, a quality cosmetic dog shampoo, dogs do have different PH, you wouldn’t use dog shampoo. There are several high-quality brands specially formulated for grooming. Most must be diluted. What kind of shampoo? The stores are stocked with all kinds but how do you know which is best? This is strictly opinion but I found that a lot of over the counter shampoos didn’t produce the results I like. Now, I invest in quality shampoos, some formulated for simple bathing and others for show grooming, worth every cent! #1 All Systems® and Coat HandlerTM make fine everyday shampoos. Clarifying shampoo should be on hand to remove buildup every few months and give a fresh start, check out Chris ChristensenTM products. Prepare your shampoo: preparing your shampoo. Many are formulated to be diluted with water. Fill two squeeze bottles first with warm water, add your shampoo to bottle one and conditioner to bottle two, close and shake. Bathing is easiest when your sink or tub is equipped with a sprayer. I prefer an ergonomic sprayer with an on/off button. You can purchase sprayers with adapters for the sink or tub. In my salon, I installed a utility sink because of the high sides and perfect size. It was placed on a waterproof base to lift it up higher for comfort. Never leave your dog unattended for a second. Have what you need at hand if you must walk away, bring your dog with you, better safe than sorry. Place your dog in the sink or tub on a rubber bath mat to give him traction. Use tepid or warm water spray downward and rinse well, especially the feet and hind area. Add shampoo working from head to tail, if your pup has longer hair, then rub the shampoo into the hair in a downward motion, not in a circular motion which can create a loss of hair and tangles. Rinse and shampoo again. Rinse, add conditioner wait a minute or two and rinse, rinse, rinse. Gently squeeze out the excess water off your dog’s feet and wrap him up in a soft towel, tell him how good he was and allow him to stay wrapped up for 5-10 minutes. For short-haired dogs and in the warmer months, I’ll put them out on the deck to shake it off, cuts my drying time in half. When drying use warm air to avoid accidental burns. Hot air can be too harsh for your Havanese dog’s coat. Learn about the Bin Bath! Years ago a Havanese breeder shared this tip with me and I am so grateful she did! It makes for a far easier and faster way of prepping a long coat. For a demonstration. This Video Bin Bath.